For centuries, the Strait of Malacca has been one of the great thoroughfares of global commerce. In the old days of wood and sail, the 500-mile ribbon of water, which connects the Indian and Pacific oceans between Malaysia and the Indonesian island of Sumatra, carried pricey spices from the islands of the Indies to the eager markets of the West. Today, about 40% of the world's trade passes through the strait on 50,000 vessels that ply its waters every year. Oil from the Persian Gulf flows east to China and Asia's other voracious economies, which in turn send back manufactured goods to the Middle East and Suez Canal. What happened? Maritime security analysts say a combination of factors  both on sea and land  contributed to the pirates' near total defeat. Most significantly, the success in the strait shows how concerted and well-coordinated action by regional governments can prevent pirate attacks on commercial shipping. "From Roman times to the Barbary pirates, throughout history, the reasons [for resolving piracy] are always the same," says Pottengal Mukundan, director of the International Marine Bureau in London. "For pirates, it becomes a much riskier activity. That is really the deterrent." Until recently, that deterrent simply didn't exist in Malacca. The main countries along the route  Malaysia, Indonesia and Singapore  were not working together. With their militaries distrustful of one another, the governments almost never shared information on pirate activities, allowing them to operate unchecked. But in 2004, the piracy problem became so severe that it was threatening local economies  especially Malaysia and Singapore, which rely heavily on trade for economic growth. Fears were also raised in regional capitals that outside powers  whose own trade was being affected in the seizures  would intervene in the strait if the local governments didn't solve the problem themselves. A new spirit of cooperation took hold along the strait. "All of us shared the same goal and objective," says Zahari Jamian, a captain in the Royal Malaysian Navy, "to paint the picture to the world that the strait is not really a war-risk zone." The results were a series of measures taken collectively, mainly by Singapore, Malaysia and Indonesia, with some cooperation from Thailand, that significantly improved security in the strait. 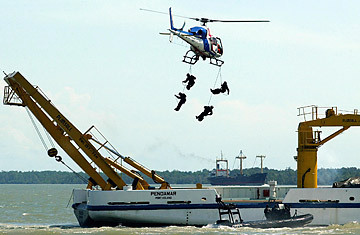 Beginning in 2004, the local armed forces organized coordinated sea patrols. Each side polices its own territorial waters, but they communicate with one another on potential pirate activity, greatly enhancing the effectiveness of the patrols. In 2005, they added regular sorties of airplanes to scout the strait for pirates. The flights are undertaken by crews with nationals from the different countries so they can better share information. Intelligence gathered on pirates is also disseminated among governments, including on a Web-based network for quick and easy access. These actions, taken together, made it far more costly and difficult for the pirates to operate. "It dawned on the states that piracy is transnational and nothing that could be handled by one nation alone," says Nazery Khalid, senior fellow at the Maritime Institute of Malaysia in Kuala Lumpur. "The sea doesn't respect borders." The case of Malacca gives at least a glimmer of hope that the piracy problem in Africa can also be tackled. The success in the strait clearly shows how committed and carefully orchestrated naval action can combat pirates. But analysts warn that the lessons of Malacca also tell us how much more difficult fighting the Somali pirates will be, because of the very different conditions on shore in Africa. The countries along the strait possess the resources and organized governments necessary to stand up to piracy. Those crucial elements are lacking in destitute and disorderly Somalia, where most of the pirates that are terrorizing the Gulf of Aden hail from. That fact alone makes the situation in Malacca and Somalia "completely different," warns Nazery of the Maritime Institute. "Piracy, whatever happens at sea, is symptomatic of a different problem  the instability of the political situation in Somalia," he says. As the nations along the Strait of Malacca learned, fighting pirates in the long term takes a lot more than some swashbuckling. See pictures of modern-day pirates. See pictures of the brazen pirates of Somalia.